My 3 1/2 year old an wanted to be buzz light year. 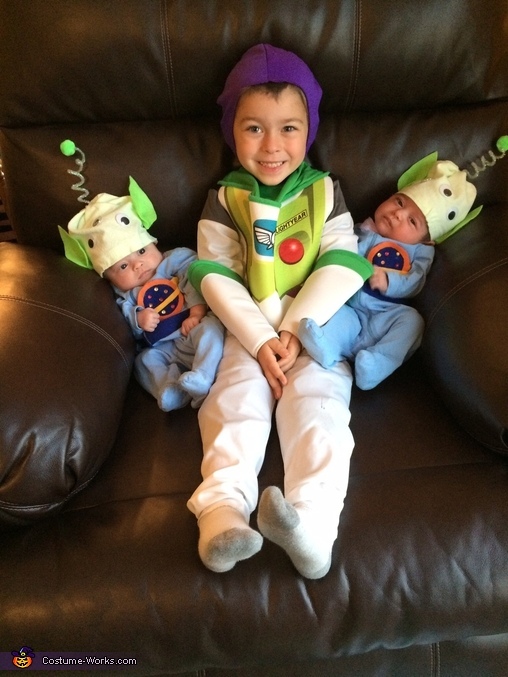 When I asked what his new sisters (born 8/27/14 preemies) should be, his reply was "aliens". I used My sons old sleepers and used felt and sequins for those. I took a receiving blanket, felt, hot glue & good eyes for the hats. BEAUTIFUL family* Yep..this one SHOULD win. How could these adorable kids be anything but winners...mom did a great job on their costumes as if she had extra time! This is so creative & adorable! My talented bestie has the most adorable kiddos!! I hope they win, too cute not to. Great costumes and lovely picture of the kids!